Having recently passed what was my 3rd Magento certification I’m beginning to consider myself somewhat of a veteran of the genre. The after-hours study sessions and the endless learning of Magento’s least significant areas of functionality are things that I won’t miss now that the exam is over. The MCSSÂ certification is perfect for someone in my line of work, someone who’s constantly scoping and quoting Magento websites. Someone who has to get toÂ the very fabric of a business’s onlineÂ ambitions and translateÂ them into a perfect e-commerce solution. In many ways the MCSS exam was the hardest of the lot to pass in my opinion, with the developer one being the toughest and the frontend developer one being the easiest. 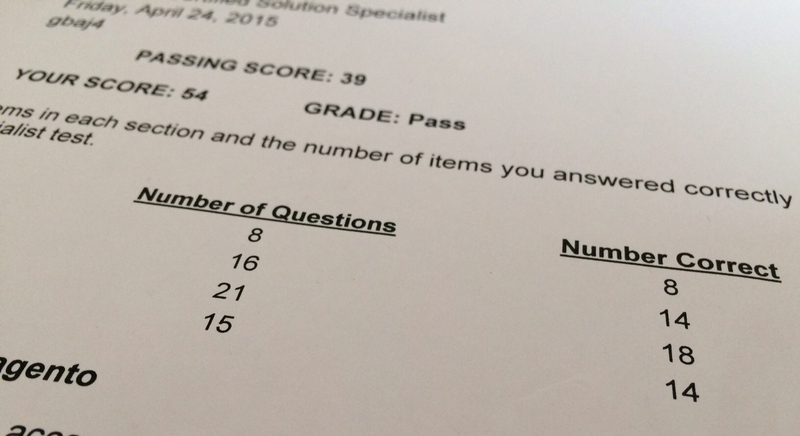 To my surpriseÂ I achievedÂ a decent overall score on the MCSS exam with 54/60 answers correct. Now that I’ve got my egotistical bragging out the way, let me explain why it was difficult without giving too much away. The questions can be quite confusing and also in some cases a bitÂ vague, which will leave you looking at the screen for several minutes desperately waiting for the meaning of the question to ‘click’ before you attempt to answer it. I recall one question that didn’t mention whether the ‘Magento’ they were alluding to was Community or Enterprise edition. The answer depended heavily on the outcome of that scenario. It’s a bit like asking ‘who of the following is not a football playerÂ for Manchester?’ and choosing fromÂ a list of City & United players. In some cases the answers were also very similar, deliberately making you think criticallyÂ about why the answer you’re choosing is the correct one. I remember there was a question about the agile methodologies that left me perplexed asÂ none of the answers appeared to be correct. In the end it was a case of eliminating all the least likely answers leaving you with the least, least likely. The questions also force you to think more subjectively about yourÂ answers. You have to think about context and intent beforeÂ applying your Magento knowledge to each scenario. In previous exams the answers tended to be more black and white as it’s a case of spotting the error in the code. MCSS does not contain a single line of code throughout the whole exam. What subjects arose in the exam? So what are the main subjects? Here are someÂ of the topics that I faced in my exam, but each exam may be different. It’s also worth pointing out that I, and my colleagues, studied for and passed this exam without ever having worked with Magento Enterprise Edition. If you’ve only used Community then you CAN pass this exam, but you have to learn the Enterprise features. The best asset you can take into the exam (apart from a list of answers tattooed on your arm) is experience. I have worked with Magento for 6 years and the majority of the questions were obvious to me because I have had to tackle them with clients many times over the years. WhenÂ I got asked a question about whether something is possible in ‘native Magento’ (you’ll see that term a lot) I couldÂ simply visualise myself taking the steps required to set it up. It will be much more difficult if you don’t have that experience to naturally draw from. The best asset you can take into the exam is experience. The questions asked in the study guide are a good representation of what the exam questions can be like. Make sure you can answer each question by heart. I would say that section 1, (E-commerce) which comprises just 13% of the exam, is the least important of the sections to learn as there are fewer questions. There were no questions about data privacy on my exam,Â which made me resent the needless hours we spent learning the different privacy laws in USA & Europe. Demac’s MCSS study guide is very useful with good bullet-point answers to all the questions in the official study guide,Â however don’t take it all as gospelÂ as we spotted a few mistakes during our study sessions. There are no practice exams in existence, so you really have to know your stuff. The good news is that the Study Guide itself is only 4 sections long – compare that with the 10 sections of the Developer exam and you can see that there’s significantly less to know, and lots of it is very easy to learn. The mainÂ difficulty as I’ve already stated is the tormenting nature of some of the questions. During the exam theyÂ mayÂ leave you critically questioning your Magento knowledge, until you emerge victoriously from the exam room battle-wounded but hardened, no longer an apprentice but a Magento master. Feel free to ask me questions about the exam in the comments below.